1. Q: Dan you accommodate allergies or requests to not receive a certain produce item? 2. Q; Where do I find my member dashboard? A: From P2P Home page, go to "Store" then "My Account" This is where you will find most tools to edit your account/subscription with Plow to Porch. Use the tabs on the left hand side to navigate between your Dashboard, Store Front, Order History. 3. Q: Where do I add "packing notes" to my profile to specify items of produce I do not want to receive/ allergies? A: sign in to your account then from your dashboard (the first page after signing in)you will click on "change contact info and mailing address" then go to the bottom of the page. There you will find a space labeled "packing notes". It only has to be done once and this packing note will follow your recurring subscription. 4. Q: What is the deadline for me to make changes to my order (put on hold, order add-ons, change subscription size etc)? A: Changes to any order can be via your P2P account up until Thursday at midnight (12:00 a.m.) prior to your next delivery. 5. Q: Where can I see what is coming in box the next week? A: We list the box content for you in two separate places each week. This first is through our weekly Newsletter "Plow to Porch Newsletter and Recipes" Email that is sent out every Thursday morning. We also post it to the website every Thursday morning in "This weeks Box" from the P2P home page. Here you will find a more detailed list as to exactly what items and the quantities of each item included in each box subscription size. 6. Q: How do I suspend/hold my deliveries? A: There is a delivery calendar on the right hand side of your User Dashboard. Click on the date you would like your box suspended/put on hold, then press “Hold Delivery” button. In order to reverse this action push the same button that will now say “Get Delivery”. If you would like to hold your delivery for multiple weeks you can then choose the “suspend delivery” button below your delivery calendar and this will allow you to choose a start and end date (by clicking the dates on the actual calendar above) to make longer term holds. **The color on the calendar around your delivery dates will help you see what is the status of that delivery(color key located below the calendar). 7. Q: Can I have recurring add-ons? placing the order to weekly or bi-weekly. 8. Q: Can I have multiple box subscriptions on one profile? A: Yes. Sign into your P2P account at Plowtoporch.com, go to the Store and add another Box Subscription to your account. 9. Q: How do I cancel my box? A: On your User Dashboard you will see a link in My Subscriptions category box that reads “View/Modify My Subscription”. Click on this link. Then you will click the button that reads “Cancel Subscription” button that is under the subscription you would like to cancel. ​Organic produce and other organic products are grown without the use of chemicals, artificial fertilizers, genetically modified animals, sewage, or pesticides. Poultry and eggs meat and dairy products are produced from animals that do not take antibiotics or growth hormones. 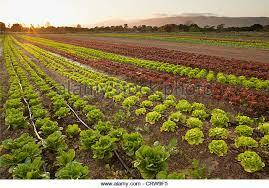 Before a farm can be labeled as organic, a government approved certifier comes in to inspect the farm to be sure that the farmer is growing according to the rules necessary for USDA organic standards. ​​The definition of locally grown differs in opinion. While some say it is a 100-mile radius, others go beyond to a 250-mile radius. Another way to think about it is seasonal produce or stock from small farms, rather than large businesses that produce for supermarkets in bulk. It is important to note that there are many farms that do not use pesticides, but they are not able to advertise themselves as organic because they have not gone through the inspection process. It is a long process to get certified. If organic food is important to you and you purchase local, simply ask your local farmer what their methods are for growing their produce and livestock. You may be surprised to learn that they safely grow their products as you would consider to be organic. When you purchase your produce locally, you get the most nutritional value out of that produce. 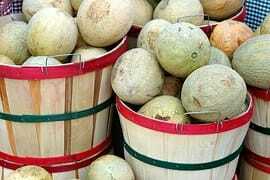 The faster you eat it from the time it is picked, the better the nutritional value. If you are not eating local, nutrients from your fruits and vegetables are depleting as they are being transported. 1500-miles or possibly even a week old is how you will find it at your grocery store. Variety: Most of the best tasting fruits and vegetables cannot handle the shipping and handling process because they are so tender. Assurance Of Farm Practices: When produce is coming from out of the country, we have no assurance as to how the produce was grown or what chemicals were used in the growth process. This rings true for the meat and poultry and dairy products as well. When buying from local farmers you can question their practices or if they are already insured by the government you can rest assured that they are organic if they are deemed to be so by the US government. Local farmer support: It is always nice to support local businesses and local farmers. 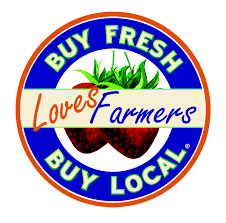 Your purchases from the local farmers assures that they stay in business and your community continues to grow. Support the local economy: By spending your money in the community and keeping the money within, the local economy will encourage growth. Direct environmental effects: Buying local reduces the gas that it would take to bring the produce to your part of the world. You are saving the environment from the pollution of the gas, the use of polluted soil, and polluting the groundwater. 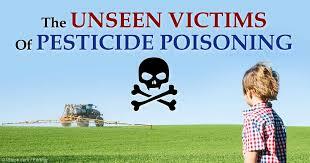 There is growing concern among the scientific community that pesticides and other chemicals have long lasting effects on people. People are more susceptible to the effects of the pesticides in fetal development and in childhood. There has not been enough research done to determine the full impact of pesticides in foods, but it is still recommended to avoid pesticides whenever possible. Does Washing & Peeling Help? Those precautions will help, but you won’t be able to completely eliminate the pesticide or other chemicals. Then you are also eliminating valuable nutrients when you remove the peel to avoid the pesticides. If you do not eat organic, your best option is to vary your diet, and wash all produce before eating. ​When Should You Buy Organic? Whenever possible. When that isn’t an option, try to go with the lowest contaminated pesticide fruits and vegetables by using the Shopper’s Guide to Pesticides in Produce. 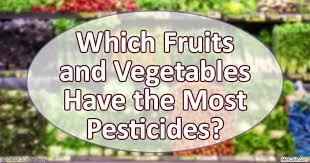 What Is Produce Pesticide Load? What Produce Are Top Of Toxic Load List? The most contaminated fruits were found to be peaches and apples. A staggering 97% of the peaches and 92% of the apples tested positive for pesticides. An astounding 87% of peaches and 79% of apples had two or more pesticides on them. The remaining fruits and vegetables on the most contaminated list include the following: celery, cherries, strawberries, lettuce, potatoes, sweet bell peppers, nectarines, spinach, imported grapes, and pears. On the Constantly Clean list were onions, avocados, and sweet cord. Short list! For these 3 foods, over 90% of the fruits sampled had no pesticide residue detectable. Other fruits and veggies on the list include the following: mango, asparagus, pineapples, bananas, kiwi, broccoli, sweet peas, cabbage, and papaya.